Is it possible? That's the question I find myself asking more and more lately. Cincinnati has been doing a number of great things lately and the place we all love seems to be making positive strides in a number of areas (i.e. education, public safety). With all of these positive steps forward there seems to be a never-ending list of more items that we all want to see happen. There seems to be a large contingent of people out there who want to see the region's transportation system improved. Maybe it's light rail, streetcars, buses, bridges, or something else. You might like the idea of one, some, or even all of these...or maybe you like parts of some and not of others. That's not what I'm talking about. What I want to know is are we capable of doing several of these things without jeopardizing the others? I am in favor of the streetcar system, but I would also like to see our bus system reformed and expanded. I would also like to see a light rail system that goes right along with a regional high speed rail system connecting urban centers across the Midwest. It is not an either/or proposition here. We can have improved bus service AND invest in the beginnings of a comprehensive streetcar system. We can rebuild I-75 through Queensgate and the West End while also incorporating "green" strategies and reconnecting neighborhoods. And I think we can repopulate Over-the-Rhine without also displacing or harming the current residents there. It's just a matter of will, and I think Cincinnati is starting to build up the necessary will to be able to act in such a way (see The Banks, QCS II). Are you on board? Sign me up! Streetcars have to be the #1 transportation priority. Bus service is adequate as is, and while it would be nice to do both at once, if it comes down to one or the other then creating a streetcar system has to take presedence over overhauling a functioning bus system. Once we get the streetcars in we can start advocating for light rail......we got nowhere to go but up right? Yes, Randy, any of this IS possible if we all play our cards right. 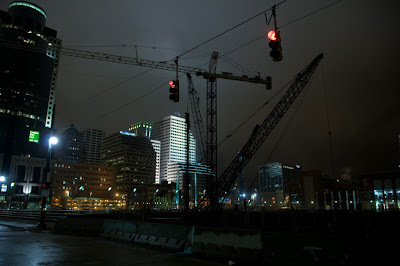 Those who think that neglecting our problems, and not investing in our future currently do not see the connection between the viability of the city of Cincinnati, and the wellbeing of the surrounding areas. We have to change the public opinion about Downtown, and remind suburbanites that if downtown crumbles, the region will have big problems. I for one want to see transit improved, bring on the light rail, street cars and bridges....we got enough buses for now.